Sample Essays Can Inspire Topic Ideas! 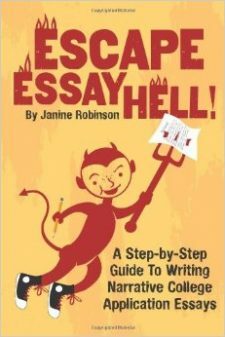 In a previous post, I shared a sample essay from my college application essay writing guide, The Writing Survival Kit. Here’s another original sample essay from the same collection. I believe reading sample essays is not only a great way to learn how to craft a personal, narrative style essay for your college application, but a wonderful source of topic ideas. I love how the writer, Sophie Funck, started her slice-of-life essay with a simple real-life moment, and then went on to explain what she learned from that experience. You, too, have real-life stories and experiences that you can spin into engaging and effective college application essays! As I walked into class, I spotted the two dreadful words on the white board before I even slid into my desk. They could have been in flashing neon lights: “Pop Quiz.” Even though I had completed the reading homework, I knew I was sunk. My cheeks grew hot as I tried to ignore my classmates’ pencils furiously writing down answers. “Think, just think,” I told myself over and over, trying to conjure the relevant facts and information. Even though I read the exact words in the same book as everyone else, nothing stuck. Ever since I was old enough to try to memorize facts or read out of textbooks, the information seemed to float right out of my head. I could spend hours reading and re-reading every page of an assignment, but the next morning it was all a vague memory. Looking back, I have always taken the longest to learn anything. I could not read until the second grade. While my friends advanced to chapter books, I was reviewing sight words, over and over again. Even though my brain insisted on taking its sweet time, I always knew I was smart. I just learned differently. My parents figured that out early on and supported and taught me through my strengths. “Different isn’t a bad thing,” they would often say. Finally, I was tested and discovered that I have an auditory processing and visual memory disability, which means I take longer to absorb information. Despite the diagnosis, I forced myself to think I was a stellar student because I knew if I worked twice as hard and twice as long as my classmates, I could compete at the highest level. In grade school and junior high, teachers set homework time limits for me so I wouldn’t spend too much time on assignments, but I insisted on finishing the work to prove to myself that I was as capable as my classmates. I was given an assignment and I completed it, no matter what. Even though I was pleased with my grades, the feeling of being “less than” continued to linger in the back of my mind. Over time, things started to come together. I began to use different tricks and strategies to help me learn more efficiently. In history, one of my most challenging subjects, I would picture facts as stories and print out maps and pictures to help me understand the content. Creating acronyms and singsong rhymes with mnemonic devices and doing multiplication tables with my fingers were still favorite strategies. I also was a master at time management and organization. When I stressed about school, I told myself, “I will get it done,” and that “Everything will be ok.” These creative learning tools not only helped my approach with school, but with other obstacles in my life. Ironically, having been a competitive swimmer for 12 years, the focus was about being fast. Fortunately, I learned there was always something more valuable than being fast when it comes to swimming and learning. As I began my senior year, I started to realize that the feelings I had and the pressure I felt were not unusual. I understand now that being fast and mainstream aren’t always better; the ability to retain a lot of facts is not the crucial part of learning; and that smart is a highly subjective adjective. I am at peace with my way of learning. I know that I can compete in a “fast” world because I’ve done that in high school. But it’s more important for me to follow a pace and path that allow for spontaneity, reflection, creative learning and deep thought. My passion for art is a vehicle for this path. I am excited to enjoy the ride and experience a journey that supports and encourages the integration of who I am and how I learn. If you are inspired by sample essays and are ready to learn more about how to write your own college application essay, check out this Jumpstart Guide. Score Sample College Application Essays for CHEAP CHEAP!